Driving up Danby Street, a grand new structure stands above the aged headstones at Shortland Cemetery. On closer inspection it is not a new tombstone, but a memorial seat, in honour of Walter Alfred COOK. Alfred was an amalgamator to the Kuranui Company, and had been employed by them for six years. He had a grownup family, his wife Martha had died the previous year. Walter Alfred Cook was just 43 years of age when he was killed in the mining related accident. On the Tararu Road today there is a yellow Lion's Club Heritage sign that marks the area where the Kuranui Battery was located. Said to be the first steam battery with six stamps, that later increased to twenty. "Built to crush ore from the rich Shotover Mine and later from many other claims." In the early hours of 24 January 1874, occurred what was described as one of the worst accidents to occur on the Thames Goldfields. 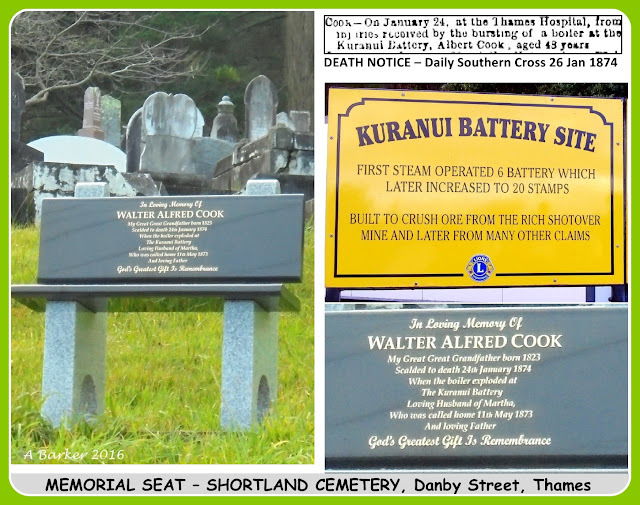 Three men died as a result of injuries received when the Kuranui Battery boiler collapsed – Alfred Cook, Richard Watson, and Matthew Paul. The three men were seated in front of the boilerhouse when “suddenly a low rumbling noise was heard, and then with a frightful hiss the steam and fire burst out of the furnace full on the unfortunate men, who were driven back by its force with great violence into the yard.” Taranaki Herald, 28 January 1874. Mr Cook was dangerously injured and Mr Watson severely scalded but appeared quite sensible. Mr Paul was walking about. The men were taken to Thames Hospital, where little could be done, and all three men died within seven hours of the accident. The funeral of Messrs Cook and Paul was held on 25 January 1874, with over 600 people in attendance. When their coffins were removed from Thames Hospital, a crowd had gathered outside to farewell the men, as the procession made its way to the Shortland Cemetery. Auckland Star, 26 January 1874. The men were buried in Plots 81 and 83 respectively. The shaded location in the photo below, gives the approximate location of the graves of Alfred Cook and Matthew Paul at Shortland Cemetery, Thames. The Kuranui Boiler Disaster led to the passing in 1874 of the Inspection of Machinery Act. A full report of that event is in an article written by Anne Stewart Ball, entitled From Disaster - One of First Pieces Safety Legislation in NZ.